Moratorium on the Baram Dam in Sarawak, Malaysia, approved! After two years of blocking all work on the proposed Baram Dam in Sarawak, Malaysia, the indigenous peoples have scored a major victory: the state government has announced a moratorium on the controversial dam and an evaluation of small-scale energy alternatives. 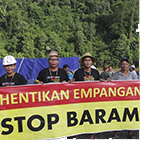 The indigenous peoples of Baram however are still concerned due to the status of their native lands which are already gazetted for construction of the dam, and of the on-going logging activities carried out with valid permits.